Since the invention of the boat, humankind has used the water as one of its primary ways to transport goods. Unfortunately, these goods have had a tendency to end up in the sea long before the we were throwing any tea parties. Large waves, storms, accidents, and simple mishandlings lead to thousands of shipping containers falling overboard every year. When these containers fall overboard, the heavy containers usually hang around just under the surface of the water until they take on enough water to sink to the ocean floor, often bursting open due to the immense pressure at those depths. This means that the contents of these containers are often set free, sometimes reaching the ocean’s surface again. On February 13th, 1997, a containership was hit by a massive wave that caused it to tilt approximately 60 degrees. Stacked high with hundreds of containers, the shift caused 62 containers to fall overboard. One of these containers held nearly 4.8 million Lego pieces. These pieces, being made of light, durable plastic, floated up to the ocean’s surface and have been washing up on the beaches of Cornwall, England for decades since (BBC Magazine). While it certainly is amusing to see beaches strewn with hundreds of Lego flowers, octopi, and dragons, these spills can have serious implications for the ocean environment. Beaches around the world can be found littered with lost cargo and plastic debris from shipping accidents. Unfortunately, there is scarce regulation surrounding the cleanup of these messes, mostly because it’s hard to determine who’s responsible for cleanup. International regulations hardly exist surrounding this issue at all, meaning that shippers aren’t even required to report these spills to ocean management agencies, and that product owners don’t have to claim responsibility for their messes. While these losses are costly both to the owners of the product lost and to the ocean environment, some people are finding ways to make something positive of the human-made messes that float around the ocean’s surface, otherwise known as flotsam. Because of the ways in which the ocean moves, certain beaches accumulate far more garbage than others. Often times, flotsam shows up in the places would seem strange to everyone but oceanographers. On January 10th, 1992, a storm in the North Pacific knocked 12 containers off a cargo ship. One of these containers held more than 28,000 Floatees, rubber bath toys that were made of durable, non-porous plastic, which allowed them to float along the ocean’s surface. Despite their landing location, not far from Hawaii, Floatees washed ashore in Australia, Chile, and eventually even Europe and the East Coast of North America. Oceanographers saw this as an opportunity. By tracking where these Floatees wash up, they’re able to map enormous surface currents and track how wind moves water around the ocean and how fast. These discoveries have helped predict the travel patterns of other spills to aid cleanup, and to help locate those lost at sea. 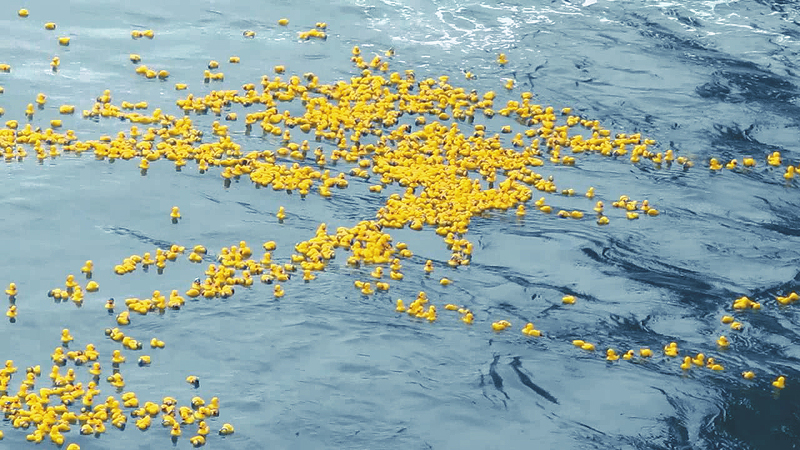 Next time you see a rubber ducky or a Lego at the beach, think about looking it up before you toss it in the trash. Oceanographers and collectors alike can offer major cash for the collection or information of the location of these items. Thanks to the collectors of washed up toys, it’s getting a lot easier to Navegate the world’s oceans.